Sunnyside has always been one of my favorite neighborhoods in the city, with its makeup represented by quite an interesting mashup of peoples and cultures, none of them dominant. 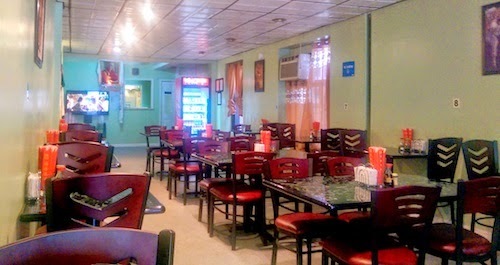 In recent years, many Tibetans and Nepalese have been moving in, and this has resulted in a few dining options. 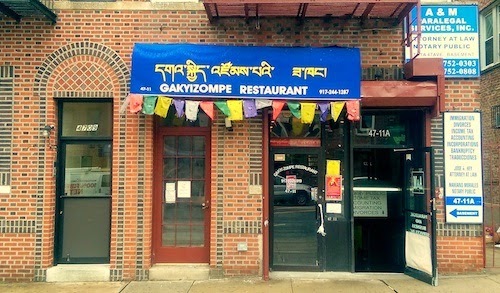 Two weeks ago, another Tibetan place has opened in a modest storefront mid-block on 47th Avenue. Walking into the long space is a surprise from what it looks like outside, but there is plenty of room for groups and gatherings. In fact, the name of the restaurant translates as "happy gathering" and we can only assume the area's Himalayan communities will indeed have such events here. A TV in the back of the space plays Bollywood musicals, and beyond that is the kitchen. When I sat down here on a Monday at noon, the place was empty but the sounds of a busy kitchen were in the air. Takeout customers came in periodically. 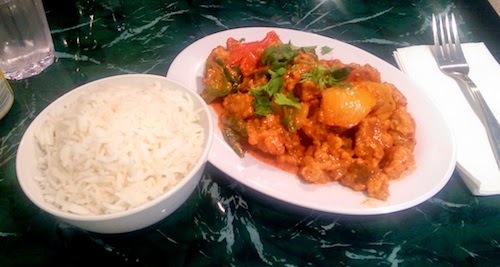 While the Dalai Lama smiled down on me from the back of the room, I was enticed by the Bhutanese dish aima dhatse ($6, below), which I chose to have with chicken. This national dish of Bhutan can be found on a few menus in Queens, and always attracts my attention. I now have a new favorite rendition as the one here is simply beautiful. The server returned a couple minutes after taking my order to ask if I wanted it spicy, as I think the chef was worried about me. What arrived was indeed spicy, the real deal from what I have read about the dish in its native environment. This plate was less cheesy and less soupy than other versions, but was delicious. Killer peppers were littering the plate, and I ate them all up as I could tell both the server and chef were sneaking glances at me to see how I was holding up. As my eyes watered and my forehead started sweating, I smiled in bliss. 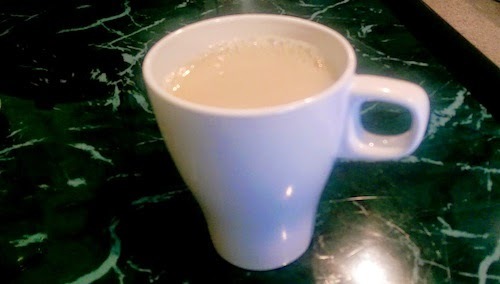 I have a real memory lapse every time I eat at a Himalayan restaurant and order bhoejha ($1, below), a salty butter tea even though I know I don't like it. It just seems so typically traditional that I have to try again each time. I was also trying to waste a little time and gain more stomach space to go for a second meal. 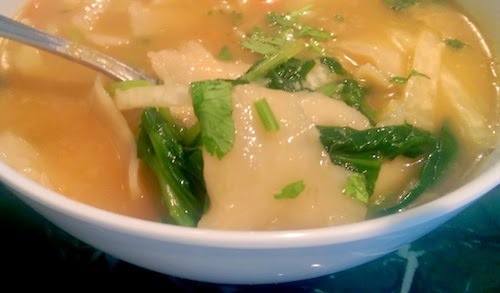 After 30 minutes of break or so, I ordered the vegetable thenthuk ($6, below), a Tibetan soup made of sliced noodles. The noodles are similar to "peel noodles" in some Chinese places, and are obviously homemade here. 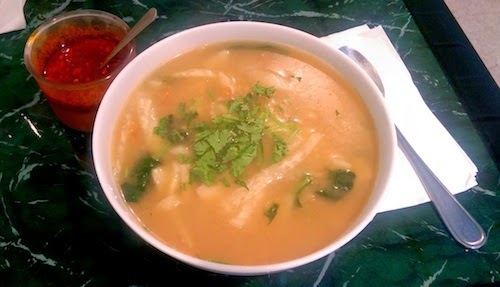 For a vegetable soup, it is amazing that a broth can be so hearty and rich, the dish is comfort food at its best. A little jar of chili paste is brought out with it to "personalize" your spice level. I will enjoy returning to this spot when I can, and it completely holds its own against the good spots in Jackson Heights. Sunnyside just keeps on getting better.